Born in 1908, Armenian-Canadian photographer Yousuf Karsh used his camera and a keenly sensitive eye to chronicle the epic known as the twentieth century. Karsh’s portraits of some of the most celebrated men and women of recent times form a historical visual legacy—glimpses of greatness and unique perspectives captured for an eternal moment. Karsh himself did not have an easy road at first; horrors of famine and the Armenian genocide shadowed his childhood, and even as a boy he was a witness to brutality and death. Karsh’s Methodist mother taught him to forgive the Ottoman Turks, however; and while his family took refuge in nearby Syria, young Yousuf was soon sent to Canada to live with an uncle in Quebec. Canada was welcoming and tolerant, and Uncle Nakash, a photographer, gave his nephew a present of a Kodak Brownie camera. And by the age of sixteen, Karsh had begun both a new life and a career. David Travis, founder and former curator of the Art Institute of Chicago photography department, presents a compelling look at Karsh the portrait master, working with Karsh’s own words while providing an artistic and historical context. Longtime studio assistant Jerry Fielder recorded numerous hours of Karsh’s recollections before the photographer’s death, in 2002, and these interviews, as well as the assistance of Karsh’s widow, Estrellita, have provided Travis with a dual vantage point of portrait taker and portrait subject. Though Karsh opened his first studio in 1933 in the midst of the Great Depression, his business did well, and he built an early reputation as a photographer in Ottawa, Canada’s capital. By 1940, his portrait commissions had broadened to include Canadian Prime Minister William Lyon Mackenzie King. 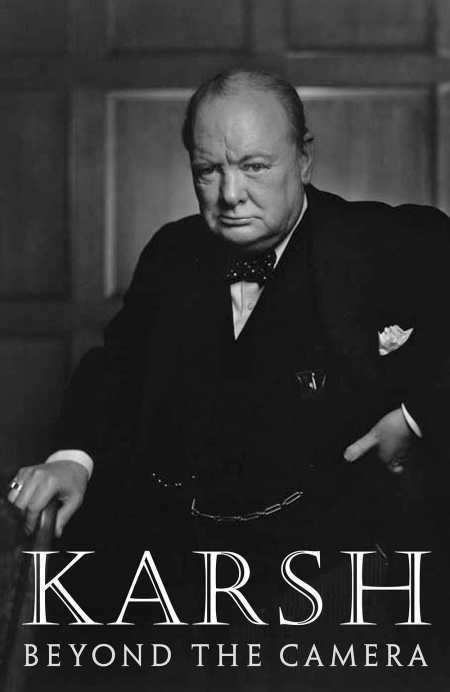 At the very end of 1941, Karsh took a pugnaciously iconic photo of British Prime Minister Winston Churchill; the portrait turned Karsh into a major name as he focused his lens upon the world’s political, military, and cultural elite. Each photograph featured in Karsh: Beyond the Camera offers Karsh’s memory of the session along with Travis’s commentary. The portraits are generally splendid, but the subtext is sometimes troubling, such as how playwright George Bernard Shaw, puckishly shrewd at age eighty-seven, noted to Karsh that Armenians were best kept “healthy and strong” by going through an extermination every now and then. Travis notes, “Karsh must have had to take a long, silent breath when he heard Shaw’s Armenian comment.” Still, Karsh could have perhaps realized that Shaw was just being Shaw, sharp-tongued and provocatively cerebral. Karsh’s works of the 1940s and ‘50s in particular offer a heady glamour or intriguing sense of gravitas: Humphrey Bogart and a waft of cigarette smoke; Harry Truman adjusting his glasses; and Pablo Picasso, who surprised everyone by being punctual and wearing a new shirt. French author Francois Mauriac was posed in a darkened profile, both for dramatic effect and because the electricity wasn’t working in his Paris apartment that particular day. There are also lovely poses from actresses Audrey Hepburn, Ingrid Bergman, and Grace Kelly (who went from curlers and blue jeans to gorgeous in minutes), but Karsh insisted that the most “sublime woman he had ever photographed” was activist and author Helen Keller, for everything that was in her soul. Beyond his technical expertise, the Yousuf Karsh of Karsh: Beyond the Camera had an unusual talent: he lent a scene of Saskatchewan wheat farmers a cinematic intensity, and he also bundled the volatile Nikita Khrushchev in winter furs to make the Cold War icon seem not so frosty. Karsh knew the world in all its good and evil, and he had a strong love for his family, including his first wife, Solange, whom he lost to cancer, and his second wife, Estrellita. This sense of connection gave Karsh’s portraits an integral depth, just as his ability to see beyond preconceptions made his photographs memorable. Travis has shown us not just a technically brilliant artist, but a man of compassion who wanted to share his vision with us all.